We’ve just completed a series of research sessions for this committed group of educators to support their high impact professional learning programs. Working for the Crayola Education team brings color and imagination to every Winter Group day. We’re proud of our contributions to the creatED professional learning initiative. Talk about a big beautiful wall…we designed and managed fabrication for this installation in honor of TCM’s 40th anniversary. Forty years of supporting educators here and around the world is worth celebrating. 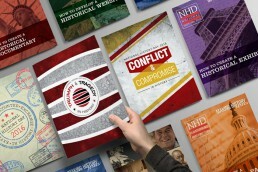 Another year, another National History Day Theme Book goes to press. For the thousands of students and teachers who dig into history with passion, we applaud you! K-12 Market Musings: Are Educators “Brand” or “Product/Solution” Buyers?